If you think of basil as an Italian herb, you aren’t alone. Lots of Americans think basil comes from Italy when, in fact, it hails from India. However, the pungent flavor of basil has become an integral part of many Italian dishes. You’ll find many types of basil available in commerce. One heirloom variety you might want to try is basil Serata (Ocimum basilicum ‘Serata’). Read on for lots of Serata basil information, including tips on how to grow Serata basil in your herb garden. Basil is a popular garden herb and a favorite of gardeners since it is so easy to grow. All annual basil varieties thrive during the warm season and require a sunny location in the garden. 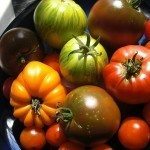 There are dozens of varieties and cultivars of basil and most of them will give tomato dishes a kick. But basil ‘Serata’ is something special and definitely worth a second look. This is a type of basil plant that has been around so long that it is classified as an heirloom. It has ruffled leaves and a good spicy basil flavor. 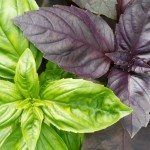 Basil ‘Serata’ is a unique variety of heirloom basil with a strong flavor and an attractive look. In fact, according to Serata basil information, these plants are really lovely. The bright green leaves of Serata basil plants have fancy ruffled edges. These make them pretty enough to do double duty as a garnish. 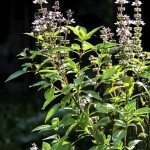 If you are considering growing Serata basil plants, you’ll want a little more Serata basil info. Most basil is fairly easy to grow, and Serata basil plants are no exception. You’ll need to site this basil in a sunny spot of the garden, preferably a full sun location, to help it thrive. Basil needs well-draining soil with a soil pH of between 6.0 and 6.5. Fortunately, this pH range is also ideal for most other vegetables. Enrich the soil by blending in organic compost since Serata basil plants prefer a rich soil. Start basil seeds indoors a month before your outdoor planting date. Sow them ¼ inch (.6 cm.) deep and watch for them to sprout within 10 days. Pot up a plant when you see two sets of true leaves. 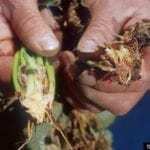 Transplant in the garden when the temperature warms and mulch with pine straw.